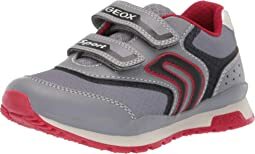 The name GEOX stands for the combination of "geo" - the Greek word for Earth, on which we all stand and walk - with the letter "X"- a symbol for technology. 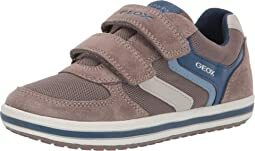 The GEOX name is the essence of a footwear company founded on the revolutionary idea to create a comfortable climate for the feet in every season and all types of weather. Since its creation in Montebelluna (North East of Venice, Italy) in the mid 1990's, GEOX has quickly gained global popularity. The Shoe that Breathes was the result of a revolutionary new idea to provide shoe ventilation after years of laboratory research, combined with Italian style and refinement. 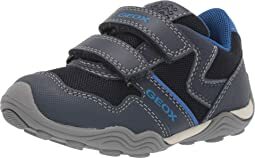 GEOX brought the footwear industry a revolutionary product: a shoe with a breathable sole. In only a few years GEOX footwear has gained millions of customers around the globe. This means stylish, happy feet everywhere! My son loves these shoes! 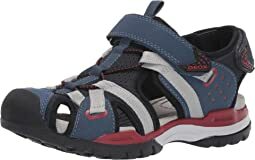 Comfy and great for active boy! These are great for regular to narrow feet. unfortunately the smallest they have is 1 but my girl really needed a 13 or 13.5. We may try again when she is ready for the next size up. 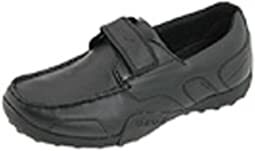 These are nice looking shoes and I like the brand - we have purchased shoes from them before. These however were soooo hard to get into we had to send them back. Even with a shoehorn they were just too hard for my 7 year old to get on. We ended up with a Florsheim very similar but the toe box was more rounded instead of Geox's hip square toe. Excellent shoe. Nice looking, and fit great! I purchased these for my 21 month old daughter. She seems to be in between 6.5 and 7 at the moment and the size 7 toddler that I purchased was huge on her so I returned them. Even if they had fit, I probably would have returned them as the leather was very stiff, particularly around the heel/ankle area. 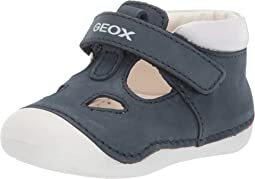 I really wanted to be able to find a Geox sandal for her because I love how the shoes let their feet breathe and they don't get sweaty, but most of the sandal styles did not have small enough sizes available to order. I purchased these for my 3.5 year old daughter. This is actually her second pair of Geox shoes. The first ones were bought at a children's shoe store. I didn't realize at the time how the shoes are designed to "breathe" and help so that her feet don't sweat. She has outgrown those so we had to get the next size up. These are great for protecting her toes when playing outside, particularly when riding her balance bike; the soles provide good traction. 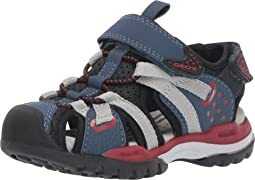 Perfect shoe for active boy. Very sturdy but not stiff-- comfortable right out of the box. The vecro straps and great and seem like they will last for the life of the shoe. High quality sneaker. Very satisfied. Purchased these in 3.5 for my 10yo. She absolutely loves the style and color. She recently started wearing size 3.5 shoe and the heel slightly slips out. 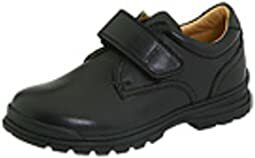 My son really likes these loafers, and wears as his school shoes (all black sneakers or shoes are required). I have suggested switching to sneakers as many of his friends wear, but he insists that these are very comfortable and doesn’t want to make the change. They are lightweight, soft leather. Thumbs up! These are really well built shoes. My husband was very impressed. We haven’t had them long enough to comment on durability but the look like they’ll last. Will definitely come back to this brand again. These shoes are exactly what I was looking for!! My toddler has sweaty piggies and the have helped SO MUCH in just 2 days! 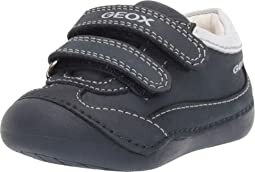 I will forever buy Geox shoes!! Zip on side made them too narrow. After reading the reviews & knowing the brand (and the hefty price that goes along with it), I expected these shoes to be a perfect fit. I bought size 5.5 for my 13 year old and size 5 for my 11 year old. The shoes turned out to be true to size in terms of length but way to narrow for both, which is surprising because neither of them has wide feet. In fact, I always believed that one of them has narrow feet. The one with the narrow feet was able to squeeze his foot in but said that it's unbearable to wear them and the one with the normal feet couldn't get them on at all. Since Zappos is great with returns, there is certainly no harm in trying these for yourself (they certainly look very nice!) but beware that they run super narrow. My little guy loves the red! Great color and he said super comfortable! I'm a woman with small feet -- I'm usually a European 34 and a US 2. I. Love. These. Shoes. But -- oh, no! -- they were just a touch too small! I kept trying to figure out if they might stretch or if I could live with the slight tightness around the toes ... and I just can't. They're for a trip and I'll be doing so much walking, I can't take the chance. Make it available in a 35, Zappos, and I'M THERE!! These are really nice looking shoes, however they run small and extremely narrow. My 9 year old son has an average width foot. Based on previous comments we ordered 2 sizes, one size 3 (his usual size) which was way too tight and small, and the other a 3.5 (a half size up from his usual). The half size up was still exceptionally narrow. He refused to wear it. I would encourage this brand to either make a wider "regular" shoe or offer this shoe in a W width. My son said these were very comfortable. He wears them everyday as part of his school uniform. I bought them to replace a similar shoe made by Florsheim -- the sole of that shoe wore through in only a few months. 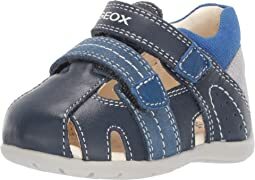 The sole of the Geox shoe is thicker and hopefully will last a bit longer. The quality of the leather is very good. Over all a comfortable shoe. They seemed to run slightly narrow. Perfect balance between comfort and looks.